Goatsoaps. com uses 100% Fresh Goats Milk Soap with Honey,all Natural and Organic, AND IS MADE IN ORANGE NSW. Goatsoaps. com source their Creamy Fresh Goats Milk and ingredients from Australian farmers, fresh Weekly.They are raw and have not been tampered or modified in any way. Goatsoaps. com do not use water or artificial colourings in their soap. You will not find another Australian handmade natural organic soap made of fresh Goats Milk Soap, which contains 50% Fresh Milk Per Bar. This soap is perfect for the person who want to use a natural soap THAT IS FREE OF CHEMICALS AND IDEAL FOR SENSITIVE SKIN. Each Soap weighs around 100 – 120gms and includes 50% Fresh Goats Milk, Yellowbox Honey, Olive Oil, Canola Oil, Sweet Almond Oil, Grapeseed Oil, Coconut Oil, Palm Oil and Castor oil, Oatmeal & Lavender. The refreshing Citrus scented lotion makes you smile every time you apply this lotion to your skin. 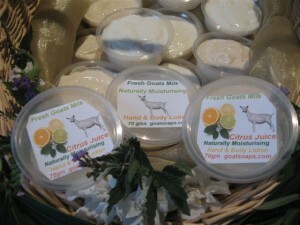 Goatsoaps.com use premium essential oils which include Sweet Orange, Lemon, Lime and Mandarine. 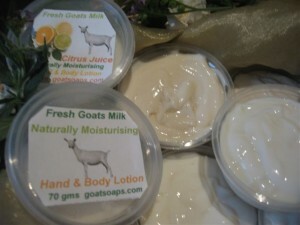 Goat’s milk is high in protein, triglycerides, Vitamin A, B6, B12 and E making it an excellent natural moisturiser that helps hydrate and nourish skin. Ingredients include Fresh Raw Goats Milk, Cold Pressed Oils of Macadamia Oil, Sunflower Oil, Sweet Almond Oil, Bee’s Wax, Vegetable Glycerine, Distilled Water, Vitamin E, Rosemary Extract and Grapeseed Extract. (natural preservatives). This beautiful soap from Goatsoaps. com is ideal as an organic and natural gift, and has a shelf life of up to 12 months.